The crash happened on US-41 Sunday evening. North Port Police said a couple was killed on Sunday after a driver slammed into their car. The driver was traveling at a high speed and alcohol may have been a factor, according to police. 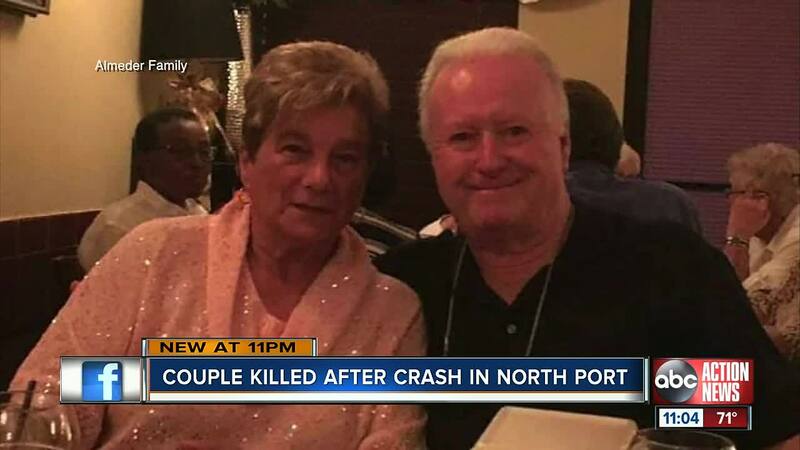 NORTH PORT, FLA.- A couple married 60 years died in a crash on Sunday night in North Port. North Port Police said the driver who caused the crash was traveling at a high speed and may have been drinking. 81-year-old George Almeder and 79-year-old Rose Almeder were on their way to their son's house to walk the dog when another driver slammed into their car. "Not much sleep during the night and today we're trying to pick up the pieces of why and how," said the couple's son, Brian Almeder. According to a crash report, there was a five-car crash on Sunday night around 7:30 p.m. on US-41 near West Villages Parkway. The traffic on US-41 was stopped to allow vehicles to leave the Braves game by the stadium. A driver failed to stop and crashed into the couple's car. "I don't know if it's a curse or a blessing. I don't think my father could survive without my mother at this age and I certainly think if my mother did survive my father, it would have been heartbreaking," said Almeder. George Almeder just celebrated his 81st birthday. The couple had 7 sons and more than 20 grandchildren. They led by example and loved unconditionally. "You could tell they loved each other a lot. It's the kind of love I want to have when I'm older. They're just so inspirational. I just miss them a lot," said granddaughter Isabella Almeder. North Port Police said the 20-year-old female driver has been identified, but police are not releasing her name. Alcohol is suspected to be a factor and she could face criminal charges pending the outcome of the investigation. Police said the driver also hit a deputy's motorcycle. The deputy was not injured. The Sarasota County Sheriff's Office said in a statement, "our hearts are heavy today after learning both individuals in Sunday night's traffic crash in Venice, passed away. A total of 20 sheriff's office deputies worked the Atlanta Braves spring training home opener Sunday night; three of whom are veteran traffic deputies. At the time of the crash, two of those deputies jumped to safety while one of their motorcycles was struck. We are grateful neither was injured." "Drinking and driving does not mix. We have Uber. We have taxis. We have friends. No need to get behind the wheel. If it turns out to be that way, it's very sad," said Brian Almeder. The family is broken over the loss of George and Rose, but feel blessed to love them. "They were just amazing people. They were always there for us. They picked me up almost every Wednesday from school and we use to go get Burger King or something. I just miss them so much," said granddaughter Gabriella Almeder. The 20-year-old driver who caused the crash went to the hospital with non-life threatening injuries. No one else was hurt in the other vehicles.